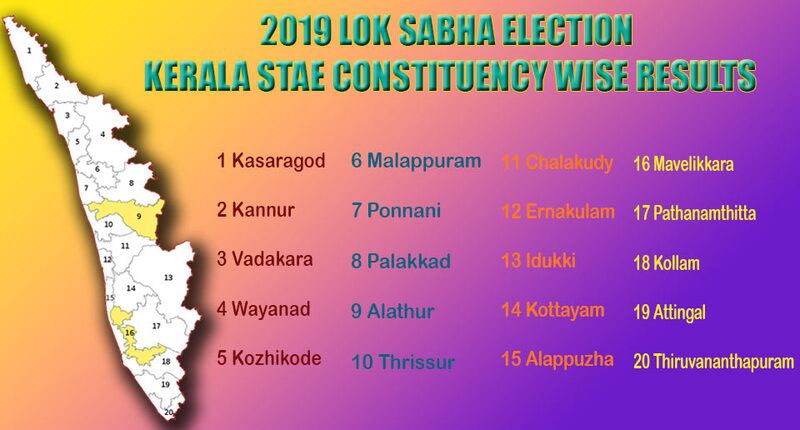 2019 Lok Sabha Election Kerala State Constituencies Wise Results will be here in Live Action. 17th Lok Sabha Election, The General Election, in Kerala will be polled on 23rd April 2019 and Results will be Declared on 23rd May 2019. There are 20 Lok Sabha Constituencies in Kerala and there are three alliance groups, United Democratic Front (UDF), Left Democratic Front (LDF) and National Democratic Alliance (NDA). UDF: Indian National Congress, Indian Union Muslim League, Kerala Congress(M) and Revolutionary Socialist Party are the political Parties Coming Under United Democratic Front in Kerala. NDA: Bharatiya Janata Party, Bharath Dharma Jana Sena and Kerala Congress (Thomas) are the political parties coming under National Democratic Alliance. Rahul Gandi is contesting in Wayanad Constituency for UDF and this gives them big hope in Kerala, Congress Looking for the victoy in more constituency with Rahul Effects.